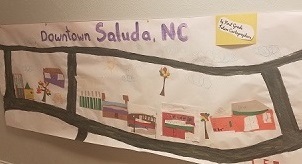 In the small town of Saluda, N.C., there are big things happening at Saluda Elementary! An A+ school since 1998, Saluda strives to put A+ philosophies and practice at the center of student learning and faculty growth. The school’s commitment to arts integration, collaborative planning and participation in A+ professional development has resulted in high student achievement and growth over the past several years and a positive school climate that is felt throughout the community. The staff of Saluda Elementary have participated in A+ professional development almost every year since becoming an A+ school. Principal Cari Maneen attributes ongoing A+ PD to her staff’s commitment to arts integration in the classroom as well as collaborative planning and the sharing of ideas among teachers. “When teachers come back from A+ summer PD, they are excited about the new ideas they gained,” Cari shared. Following each A+ PD, Cari schedules an additional A+ workday for staff to share what they learned, create a school-wide theme and work toward the same vision and goals that were set forth during the A+ conference. 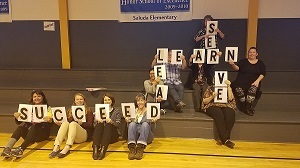 In fact, this year Saluda teachers included an A+ goal in their own professional development plans to ensure their teaching is focused on the A+ Essentials. 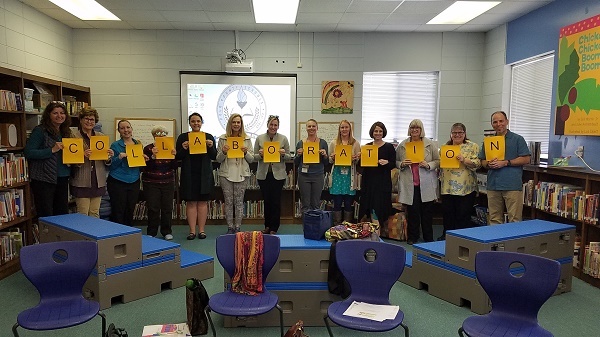 Collaborative planning meetings are also held every six weeks, in addition to regular “A+ Share Sessions,” to provide teachers with dedicated time to plan integrated lessons and units across arts and non-arts classrooms and share successful lessons, ideas and activities among each other. Cari wants to create opportunities for teachers to share A+ best practices, resources and expertise on a regular basis, which, in turn, refines their own craft and improves student learning. Not only are students and teachers highly engaged as a result of Saluda’s embodiment of A+ philosophy, the community is also involved in the life of the school. Student artwork is displayed in the downtown post office and the district office providing connections to the broader community and showcasing students’ work (thanks to the efforts of their A+ Coordinator!). Community volunteers offer afterschool programs in dance, cooking and photography, as well as literacy enhancement programs; and the entire community is invited to attend student performances, showings and information nights throughout the school year.